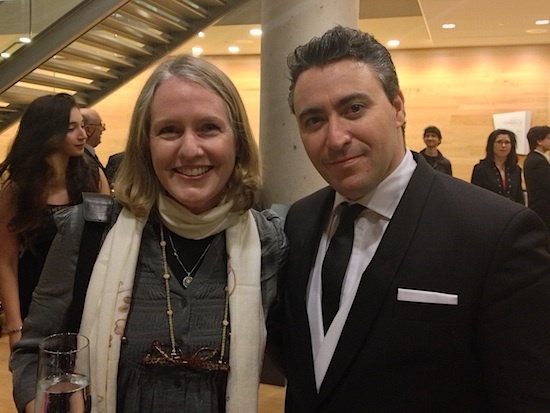 I'd never seen Maxim Vengerov play live, then for the four years when he stopped playing, it looked like I never would. But never say never! On Monday night, Vengerov played the Beethoven "Triple Concerto" for violin, cello and piano in a "Concert Prestige" to benefit the Montreal International Musical Competition Foundation. I was happy to be in attendance, among 1,200 people in the new Maison symphonique de Montréal ("Montreal Symphony House"), an impressive concert hall that is not yet two years old. It's a lovely hall with some modern aesthetic touches, such as organ pipes that dangle like silver stalagtites along the back wall, and three decks of wooden balconies that surround the floor. 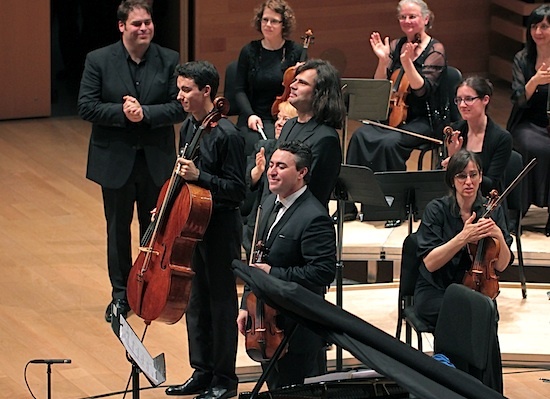 Vengerov's partners in the Triple Concerto were cellist Stéphane Tétreault, pianist Serhiy Salov and the Orchestre de chambre I Musici de Montréal, conducted by Jean-Marie Zeitouni. I was immediately caught by Vengerov's presence and sound, playing the 1727 “Ex-Kreutzer” violin, and also the young cellist Tetreault, who played on the 1707 "Countess of Stainlein, ex-Paganini" Strad. While these two were quite dramatic, pianist Salov simply nailed everything with quiet competence and little fuss. I wondered about the stage placement that had his back to the others (is this standard in this piece?) -- but nonetheless he was spot-on. Though clearly Salov's background points to a lot of solo piano playing, he seemed a natural collaborator. The Triple Concerto is full of virtuosity of a non-flashy nature for the cello and violin, like fast, awkward passages that nonetheless require impeccable intonation. Even in places where the soloists play accompaniment to the orchestra, Beethoven doesn't settle for an easy, restful, "I'm not the melody here" pattern; he makes them grab crazy notes from the sky and flutter conspicuously over the orchestra. Would you like to walk a tightrope, wearing a bathing suit? While juggling knives? I thought our heroes gave a generous and heartfelt performance. The cello solo at the beginning of the second movement was captivating, and the third movement featured some nice high-speed tandem coordination among the three soloists. For an encore, Vengerov played a favorite, "Meditation from Thais," accompanied by all. My only regret was that I'd have loved to have heard the cellist play an encore as well! The concert opened with Orchestre de chambre I Musici de Montréal and conductor Jean-Marie Zeitouni, performing Beethoven's Symphony No. 7, a frequently played piece that is dear to orchestral musicians' hearts everywhere (that's right, if you don't like it, you are a tiny-hearted Scrooge, in my estimation). But it's not a piece to take for granted -- I worried a bit during the (very exposed) introduction, when members of the string section had different takes on the tempo offered, but the orchestra warmed up nicely in the "Vivace." In fact, I was still out of breath when they segued straight into the second movement -- how can one land in the second movement with such a calm heartbeat, after riding at such a breathtaking gallop in the first? The first and seconds sat opposite one another, a nice choice in a symphony that has so much back-and-forth, question-and-answer. In the third movement, the chamber orchestra showed that it is indeed a fast-driving car, and I think I enjoyed them most when they played fast -- very exhilarating! By the fourth movement I was jumping out of my skin. It is almost too much to ask, to listen to this piece live, without playing it! But being outside the orchestra does give one a larger perspective. I never noticed how the fourth movement is so triumphant, but with a strange limp! A joy to hear this symphony. A joy to be in Montreal! Vengerov is always a show....have seen his several times in Buffalo NY when his Strad Society Benefactor had him play with the BPO and a couple sonata recitals....His incredible memory still rings as he asked for encore requests from the audience and senza piano, played all the pieces that were requested from memory...about a dozen or so. If you check out his performances of Brahms Trios on youtube, you'll note he seldom looks at the music...amazing talent...hope he stays off the weight-lifting regimen and sticks with fiddle.